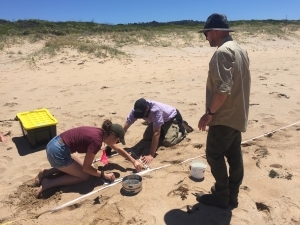 Based on Bournda Beach this science program addresses two issues of environmental importance – that of microplastics and endangered species protection. AUSMAP is a nation-wide citizen science program designed to document and analyse microplastic pollution in Australian aquatic environments. BEEC staff will facilitate a program where students collect, analyse and share microplastic data using the AUSMAP methodology. The Hooded Plover, a critically endangered bird species nests on Bournda Beach. Students will learn how they can help protect these local birds, and how they can help share this crucial knowledge back at school. We would like to send a team of FOUR Stage 3 students to this day!